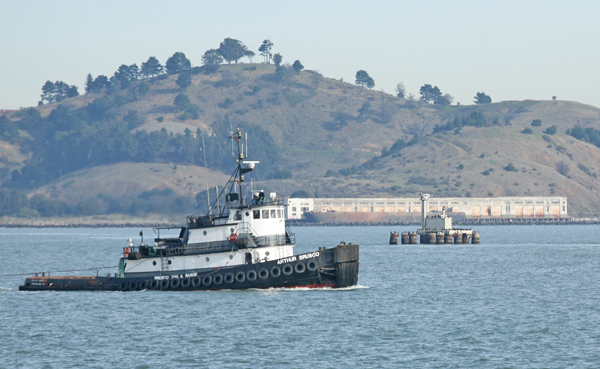 Southampton Shoal, a two-mile-long navigational hazard, lies along the eastern side of the shipping channel that runs between Richmond on the east, and Angel Island and the Tiburon Peninsula on the west. The threat of this obstacle was recognized early on, and three buoys were anchored on it in 1850 to warn mariners. The passage between the eastern side of Angel Island and Southampton Shoal is quite narrow. The strong tides setting in and out through the Golden Gate have full force on a vessel bound up or down the bay, and in the case of ships being towed, as so many are, past this point, the set of the current is enough to make it hazardous, there being danger either of running aground on Southampton Shoal or Angel Island. An enormous quantity of shipping annually passes this point, bound to or from the great grain wharves at Port Costa, the Sacramento and San Joaquin rivers, and Mare Island Strait. Hundreds of the largest sailing ships are towed from San Francisco to Port Costa, where they load with grain, and are then towed down and out to sea. In this way there is more shipping passing through these waters than anywhere else in the district, except through the Golden Gate. There have been a number of casualties in the vicinity. About December 28, 1905, a fixed white lens lantern light, illuminating the entire horizon, will be established in the structure recently completed at this station. The structure consists of eleven foundation cylinders carrying a platform supporting a square two-story dwelling with a pyramidal roof and dormers, surmounted by a cylindrical lantern. The platform also supports a cistern on the easterly side of the dwelling. 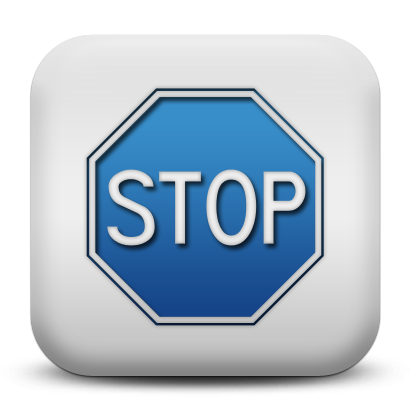 On the same date there will be established at the station a 3500-pound bell, to be struck by machinery during thick or foggy weather a double blow at alternate intervals of five and fifteen seconds. 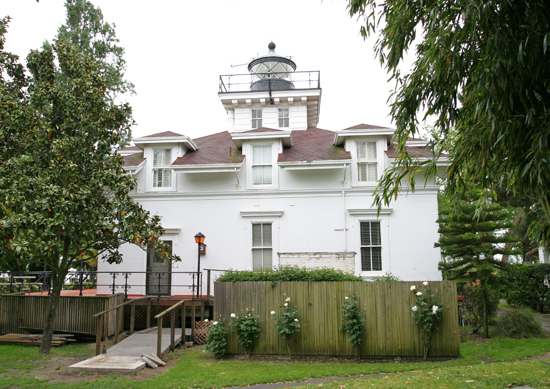 Given the lighthouse’s location and the fact that it resembled a dwelling more than a typical lighthouse, the structure was affectionately known as the “House on the Bay.” Balconies encircled the first and second stories providing an unobstructed view of the lighthouse’s beautiful surroundings. 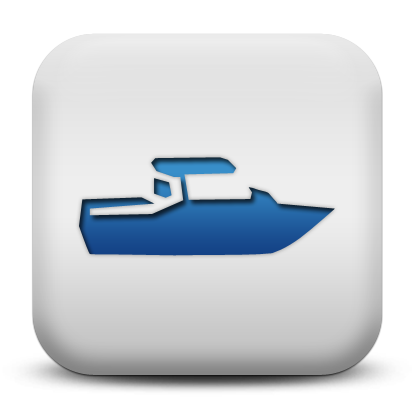 The bottom floor was used for storage and also had davits from which the station’s boat was suspended. The top two stories, divided into a pair of two-level apartments, were home to the keepers and their families, and the noisy brass fog bell. 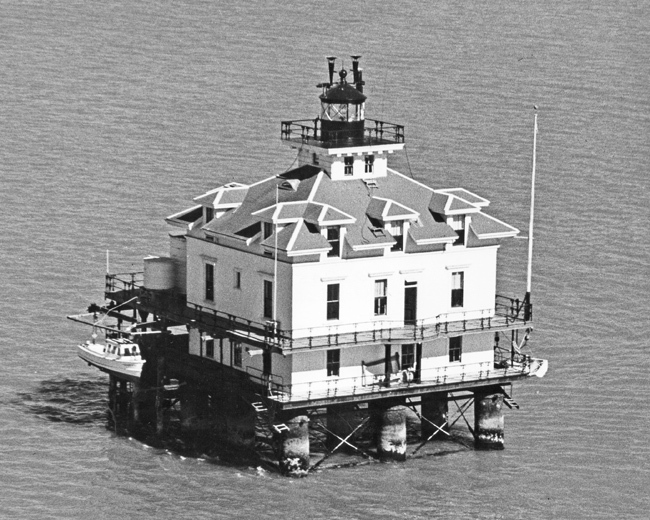 The Coast Guard photograph at right shows the attractive lighthouse on station. Not long after the light was activated, erosion threatened to undermine the cylinders that supported the lighthouse prompting the placement of 1,000 tons of rock around the steel columns. The lighthouse’s foundation was soon threatened again when the devastating 1906 San Francisco earthquake struck. The shifting fault caused the support cylinders to tilt as much as eleven degrees eastward. 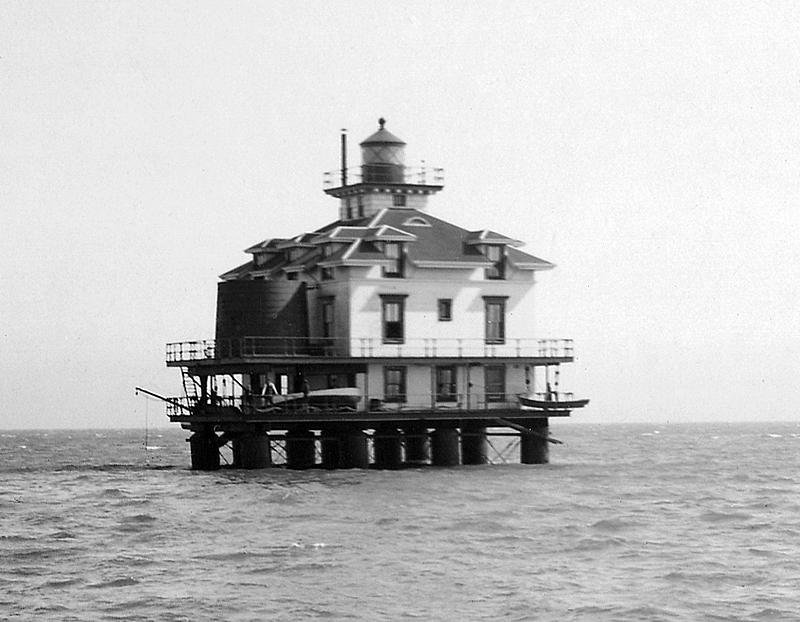 After the Lighthouse Service re-leveled the station, the steel piles were stiffened with iron cross-braces and more rocks were dumped into the surrounding waters to stabilize the foundation. Upgrades to the station included a fifth-order lens that replaced the lens lantern in March 1911 and an air diaphone, powered by a gasoline engine and compressor, which took over the function of the fog bell in 1918. In 1929, Ole Lunden could see hard times on the horizon. Though he had been working as a streetcar motorman in San Francisco, he was impressed when his friend Milford Johnson came ashore from the Farallon Islands wearing his Lighthouse Service uniform. Lunden decided to switch to his friend’s vocation, filled out an application, and soon received a call from a secretary at the Lighthouse Service office in San Francisco asking if he would accept an assistant keeper’s position at Southampton Shoal. Though he had to be told where exactly that was, Ole Lunden accepted the assignment, and he and his wife, Bernice, were welcomed to the station by head keeper Frank Schou, whose wife and family lived in San Francisco. The crews of passing tug boats were soon startled to see that women’s lingerie had been added to the laundry being aired at the lighthouse. Ole recalled, “They made a close pass by the lighthouse to get a good look at Bernice. She was the first woman they’d ever seen on this offshore station.” The Lundens soon developed a symbiotic relationship with the crews of the tugboats. The tugs would deliver a newspaper to the station and in exchange receive a fresh fish or crab for their dinner. One day, Keeper Albert Joost rowed the five miles from his station on Yerba Buena up to Southampton Shoal to ask Assistant Keeper Ole Lunden if he would like to swap assignments. Lunden jumped at the offer as he often worried when his wife made trips to shore in the station’s unreliable boats. The transfer was approved by the service, and late in 1930, Albert Joost and his wife Evelyn arrived at their new home. The decision to relocate would prove to be a tragic one. On December 23, 1935, Joost and his wife were alone at the station as the assistant keeper had gone ashore. Keeper Joost set about repairing the station’s radio and antenna using a blowtorch to heat a soldering iron. The blowtorch went out, discharging a sizable amount of gas into the air, and when Joost relit the torch, the air around him exploded, igniting Joost’s clothing and a section of the lighthouse. Evelyn Joost rushed to her husband’s aid, and together they used two fire extinguishers to put out the flames. Keeper Joost was badly burned and in need of prompt medical attention. 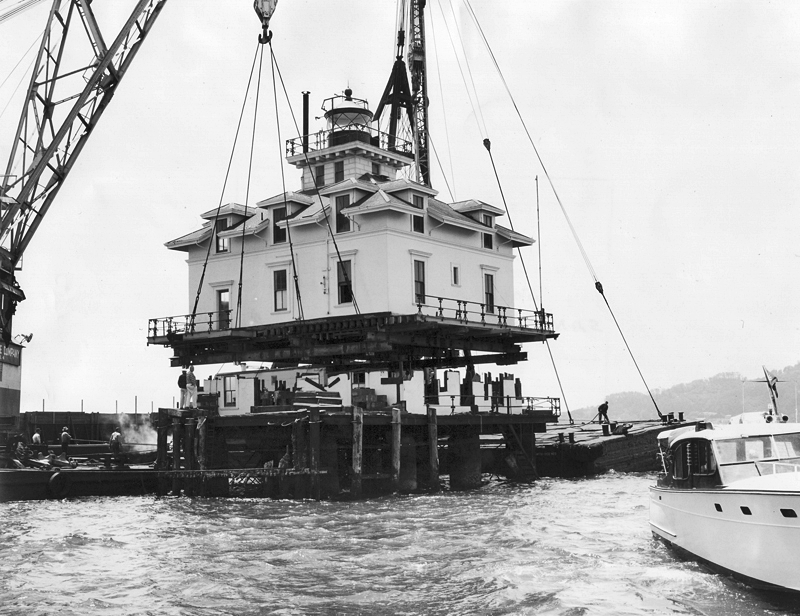 With help from his wife, Joost lowered the station’s remaining boat to the water and set out for Angel Island insisting that his wife remain at the station to keep the light. 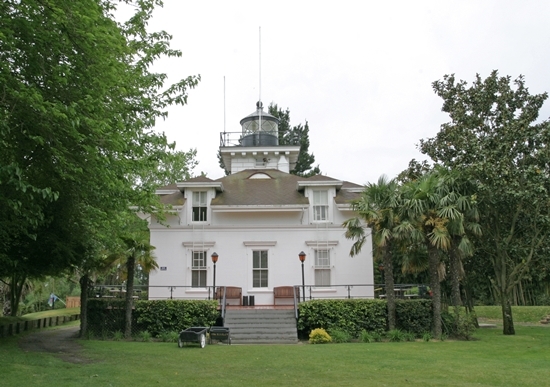 When he reached Angel Island, Joost was quickly rushed to the Marine Hospital in San Francisco by a military boat. As darkness fell over the bay, Evelyn Joost lit the lamp in the lonely lighthouse. Later that night, the lighthouse tender Lupine brought a relief keeper to the station and took Evelyn to her husband, who was in critical condition. Sadly, Keeper Joost passed away on Christmas Day from his burns. Southampton Shoal Lighthouse remained in operation until 1960, when it was determined that a manned station was no longer required. 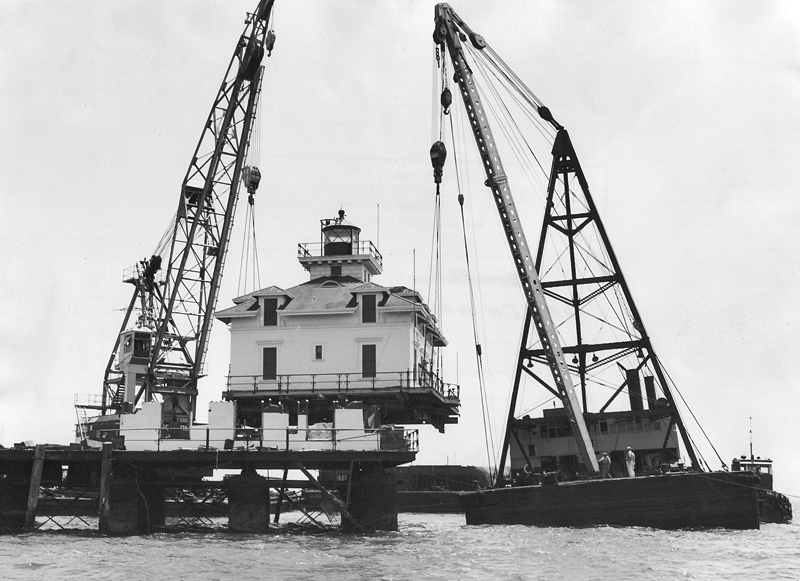 The top two stories of the lighthouse were lifted off the pilings by giant cranes in July 1966, and then barged up the delta to Tinsley Island. 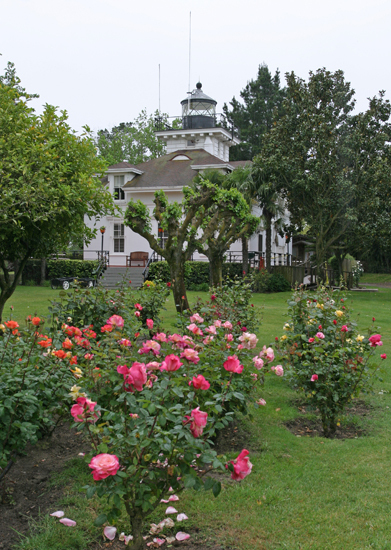 The St. Francis Yacht Club had purchased the island in 1959, and Southampton Shoal Lighthouse became an inn for club members visiting the outstation. 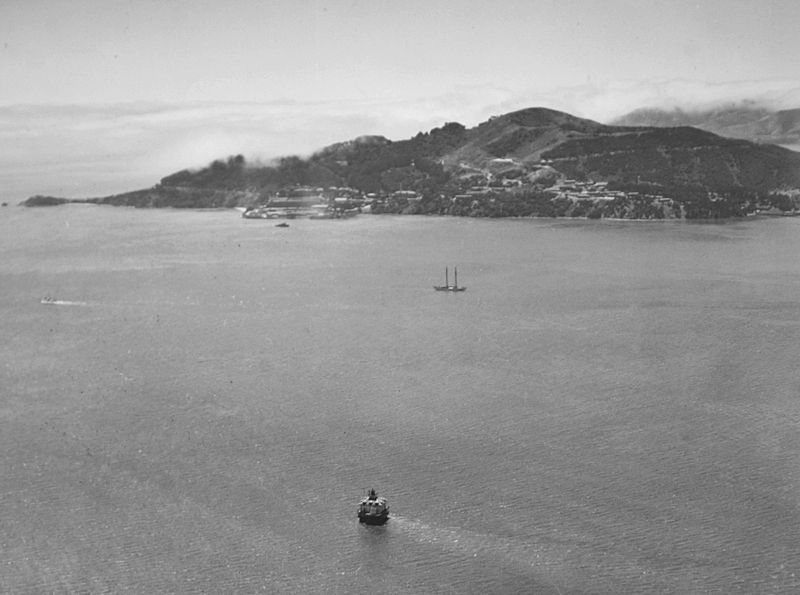 Remnants of the lighthouse remain behind in San Francisco Bay. 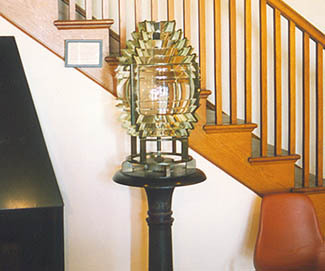 The fifth-order lens used in the lantern room can now be seen in a museum near the ferry landing on Angel Island, and the pilings used to support Southampton Shoal lighthouse still protrude from the water east of Angel Island. Few people aboard the ferries that now race past the collection of pilings realize that an elegant building manned by real light keepers once stood where today only an impersonal red light is shown from a pole. Head: Samuel David Hounsell (1905 – 1910), Thomas L. Winthar (1910 – 1916), Edwin F. Gunter (at least 1917 – at least 1919), Fred C. Saunders (1920 – 1922), Frank M. Schou (at least 1929 – 1930), Frederick S. Cobb (1930 – 1932), Albert H. Joost (1932 – 1935), John J. Woyner (1939 – 1943). Assistant: Arthur W. Pooley (1905 – 1906), Thomas L. Winthar (1906 – 1910), Frank Weller (1910 – at least 1912), Fred Prussmann (at least 1913), Joseph R. Marhoffer (at least 1915), Henry H. Wiesenhaven (at least 1917), Fred C. Saunders (1918 – 1920), Albert H. Joost (at least 1924), Max Schlederer (at least 1928), George W. Petersen (1929), John O. Lunden (1929 – 1930), Albert H. Joost (1930 – 1932), George W. Petersen (1932 – 1934), James E. Simonson (1934 – at least 1935), John J. Woyner (1937 – 1939), Henry A. Scott (1939), Burton Y. Frymire (at least 1940). The Keeper’s Log, Summer 1991. 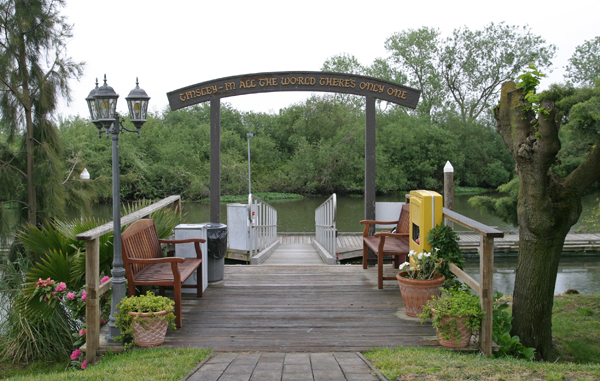 Located on Tinsley Island in the San Joaquin Delta roughly 12 miles northwest of Stockton. For a larger map of Southampton Shoal Lighthouse, click the lighthouse in the above map. 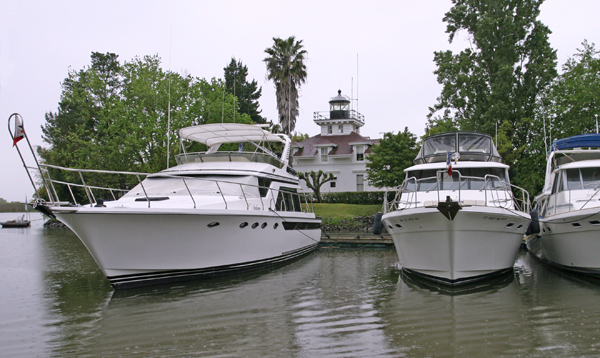 The lighthouse is used by the St. Francis Yacht Club as a station for its members and guests. 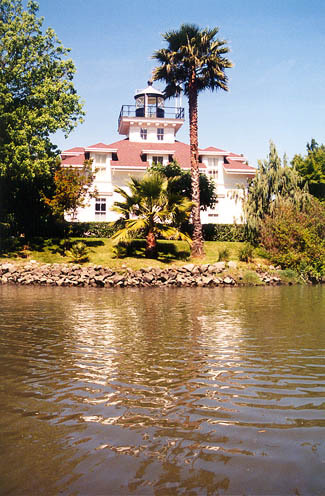 To reach the lighthouse from Interstate 5 north of Stockton, take Eight Mile Road west seven miles until it ends at a ferry. Near the ferry is Herman and Helen's Marina from which you can rent a boat or seek other means of transportation to Tinsley Island, which is just a mile or two south of the marina. 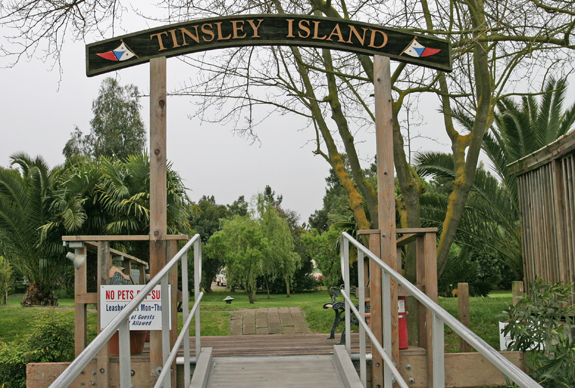 You must have permission to land on Tinsley Island, and access to the lighthouse is typically limited to guests staying in the lighthouse. The lens from the Southampton Shoal Lighthouse is on display at a museum at Angel Island State Park. 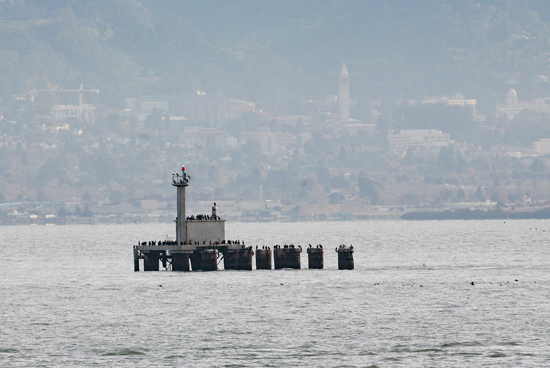 The pilings which formerly supported the Southampton Shoal Lighthouse can be seen from the ferry that runs between Vallejo and San Francisco. The lighthouse is owned by the St. Francis Yacht Club. Grounds/dwelling/tower closed.